When it came to send a folder containing important data to your friends or colleges, each time you have to open your email attach each file in the folder or zip the folder and then send it. This process would take lots of our important time. But with the introduction of Windows Live Folder Share this job is made easy and can be done in just few minutes. Just you have to create your account and set your friends and colleges with whom you have to share your folder and done, he can automatically access the folder. All you files can be kept in Synchronization. Mirror image of folder can be created. Sharing the files is made easier. Synchronization of files up to 2 GB is possible. Instant access to files when you are away. Operating system Supported: VISTA, XP, MAC. Client requires 2 MB of hard drive space for installation. 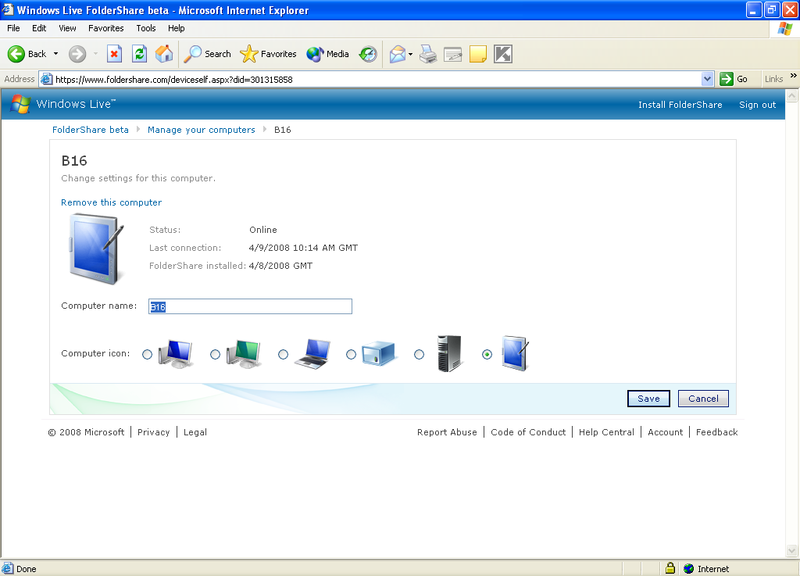 For accessing the files on any computer Windows Live FolderShare client must be installed. Hi Speed Broad band Connection. Earlier sharing files or folders were a hectic job mostly in the organization which worked mainly on data. 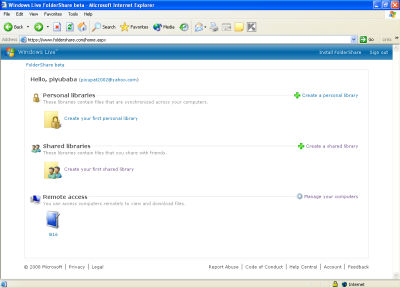 Bust the introduction of Windows Live FolderShare by Microsoft Corporation has revolutionized this folder sharing job. Today lots of applications which are capable of providing us with this feature of folder sharing are available in market. Application like BeInSync, Byte Taxi’s Folder Share, Grouper Onext etc, are some of the application which are good to it. 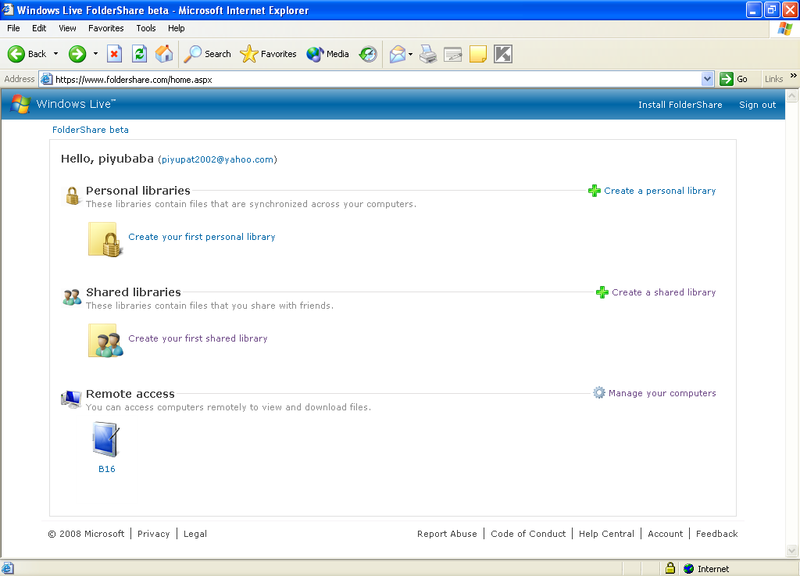 But if we consider file sharing and swapping Windows Live FolderShare is the best available utility. 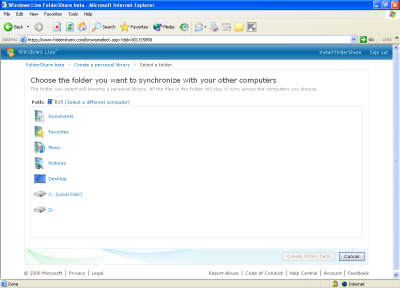 Automatic synchronization of files and folders on many PC’s is possible. If any file in any machine is updated the same up dating is done on the same files and folder on the computer which are sharing this files and folders. The synchronization of files and folder is done 24 * 7, so need to worry about the updating of data to each PC sharing the file and folder, only all your machines need to be online. Also on demand sync is available, using this feature the updating of the folders and files is done on your permission only. The setting up the network process is also very easy. 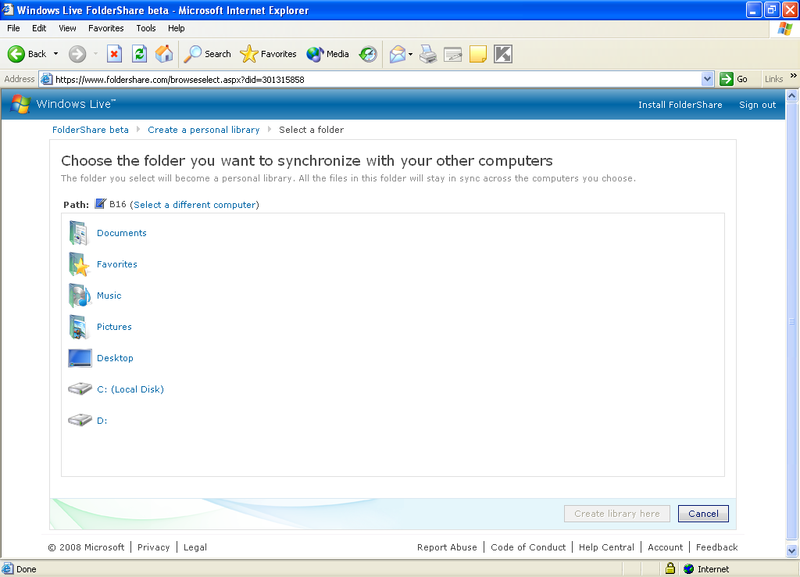 Just you have to install the Windows Live FolderShare on each computer on which you want to share the files and folders. Enter the email id on the FolderShare option and done. If a remote user wants to access your file you just have to add his email Id he will be send with the link and procedure of downloading the client and how to use the Windows Live FolderShare. Download My Files option is used to down load the files on your computer. In case of da6ta security all the data is checked with RSA keys for authentication, and encryption is done using AES. Files as large as 4 GB can be shared at a time. Three types are available in this utility. In Basic type you can sync and share only two libraries with max capacity of each library up to 500 MB. In Personal type 100 libraries with 20000 files can be sync and shared (Rate is $ 48.60 per Year). In professional type 250 libraries with 50000 files can be shared and sync (Rate $ 72.90 per year). It is more advantageous in reducing network traffic as all the traffic is diverted to the internet lines. Using the free version is good but the paid versions available also give us full value foe money. So don’t wait just try this so you can experience the real magic.